john4jack (Corvallis, Oregon, United States) on 31 December 2009 in Cityscape & Urban and Portfolio. "Over the river and through the woods, to grandmother's house we go." Nice and strong! I like the contrast in this photo. Great job! Reflects, reflects much reflects! Nice work Jack! Happy new year to you... and kisses! Happy New Year John !! All the best to you and family. So....you're on your way...to welcome the New Year! have a lovely time and may the New Year wrap you and yours in happiness and joy! Jack, I wish you a lovely and peaceful and the happiest wishes for this new year to come, for you and all of yours. Happy New Year John to You and Your Close Ones! Happy New year Jack with your family and your grandmother. @Marie LC: Thank you. That line about "grandmother's house" is from a poem. At 74, I am the oldest member of our family. When it comes to New Year's celebrations, we always just stay put. My father always said... "Over the river and through the woods, and they still find us!" Since my parents moved to Pennsylvania from New Jersey over the Delaware River and a new house in the woods! :-) Happy New Year, Jack! Nice capture ! I wish you and your family all the best for 2010 !!! Drive carefully to the end of the year and let's stay in touch trough our photographs ! Have a wonderful New Year Eve, Jack with your dearest !!!! @MARIANA: What a marvelous greeting! May all of your dreams come to fruition in 2010. And may it be a year filled with joy, blessing and peace, dear Mariana. A happy and healthy New Year for you & and family Jack! Happy New Year, Jack. Love your shots. Keep em' coming in 2010. Great shot! Amazing that you were able to get the moving car, and all the scenery in the background without movement showing in the car! PRO Skills! @Tracy: Thanks, Tracy. Look at the shutter speed. If you want movement, wait until tomorrow. great New Year Eve dear Jack ! Happy new year for 2010 Jack !! In a hybrid of course! I like the process and the story behind the title. Wishing you and yours a wonderful 2010.
great shot..like the movement...have a Happy new year..
Like this kind of urban composition. Happy Nwe Year!! @MARIANA: A kiss and a squeeze from you, dear Mariana, would sustain the soul (not to mention the body) for a long time!! when I said - a true soul , I thought - A true SOUL MAN !!!! @MARIANA: And you are, indeed, a Soul Friend! And your work is a wonderful ongoing inspiration to all of us on Am3!! "The Blues Brothers" is a classic. What a tragedy to lose Belushi! Many happy vibes in your heart and around with family, friends and dearest yours - and many more splendid images from the Chief J4J ! Hope you weren't driving!?! Nice shot--it really says "bridges"
@Bill Laing: I was standing on the walkway across the Hawthorne Bridge. So many layers in a single shot, from the foreground leaves on the cars windshield to the bridges far and distance, the tree line and the bank mof clouds. A great observation, Jack. A toast to you this evening as my mind becomes numb with New year happiness and alcohol, I hope 2010 brings you health, love and happiness. 2009 is being left behind and now crossing over to 2010.... I wish you and your loved ones a very happy new happy where you tread over the bridges to your happinesses. Totally cool! Happy New Year! An even better collection of bridges in this shot. I always like how the tinted windshields filter the light. A very successful shot. Happy New Year...may 2010 be one of the best ever. 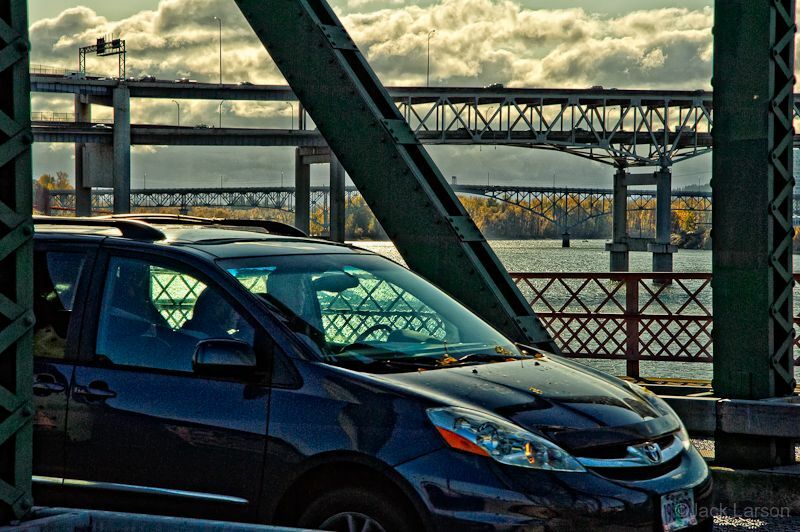 I really like your shot of the car with leaves and the bridges, however the river's emptying out to the left, Jack ... sorry, I think I have levels in my eyes. Happy New Year ... we're staying in and safe! @Judy: Check it out now. The horizon of the river is level. The bridges create a slight optical illusion. Great processing in HDR to bring out the character seen in the clouds. And what normally would have been a shaded silhouette, the man's facial features in the nearby Toyota are quite detectable. Happy New Year! @Steven: No HDR, Steven. A little Tonal Contrast in Nik's Color Efex. Like how you captured this action shot. I wonder if this couple realizes that people all over the workd are looking at them? Just love those bridge! Cool shot !! Happy 2010 ! love the leaves in the background, and the leaves on the widnshield of the car. nicely done! and so, crossing the bridge into a new year. happy 2010 jack. *Smile of approval* ... I like it better, do you?